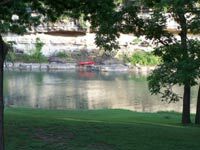 If you like fishing on the Guadalupe River, then here are some fishing cabins on the Guadalupe River that are perfect for a weekend fishing trip. You can't beat fishing on the Guadalupe River for some huge trout - you can wade fish, fish from the bank, or float fish. Make it a weekend and here is where you can find some fishing cabins on the Guadalupe River. If you're headed to that stretch of the Guadalupe between Gruene and Canyon Lake, check out this Guadalupe River Things To See & Do page. 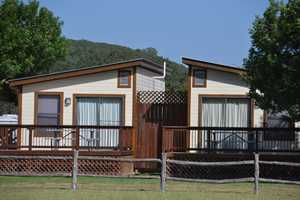 Nestled along the banks on a beautiful stretch of the Guadalupe River are the Rio Guadalupe Resort fishing cabins. Rio Guadalupe Resort is south of Canyon Lake and offers camping and cabins plus rafts, canoes, and tubes for floating the Guadalupe River.